The Adderbacks came about after a visit to the Dales Countryside Museum, in Hawes. I wanted to recreate Dales’ style gloves but… should I say the phrase ‘dumbed down’, here? Dales gloves but dumbed down. I simplified them to make them a faster knit. Some of the originals have over 100 sts cast on. I like gloves, but I don’t want to spend my life knitting just gloves so… 4 ply yarn would be more in keeping with the tradition , or even 2 ply Jamieson and Smiths, or Jamiesons of Shetland’s ‘Spindrift’ would be nice, and also maybe more traditional. But I went for DK in the end again, for a faster knit. Also, the past two winters here have been incredibly cold and snowy, and thicker gloves seemed like a good idea at the time. And so they proved to be. When the snow came again, they did their job. If you want to change down to finer wool, you will need to swatch, and maybe end up adding in a pattern repeat. Jane Austen, once asked why she didn’t dot the is and cross the ts for her readers, said : ” ‘I do not write for such dull Elves/ As have not a great deal of Ingenuity themselves. '” And that is how i feel about knitting. If you’re reading this and thinking of knitting these, and think the DK is too heavyweight for your needs – you’re already intelligent and can do the maths to make it work. Another difference between my version and the originals is that they often had one pattern on the back of the hand, and a simpler, filler style pattern on the palm. I opted for all-round lightning. Although this pattern is traditionally called ‘lightning’ (and similar to the ‘marriage lines’ you find commonly as a gansey motif); I decided to call the modern spin ‘adder-backs’ – as it reminds me of the zigzag patterns on adders. Lightning was a favourite Victorian motif. Emily Bronte went to Leeds and horrified her family by returning with a mauve fabric with a lightning print on, she made up into a dress for herself. Initials and year were often knitted into the gloves. You can find alphabet charts online, or in various books about traditional knitting. I thought laterally, and used the embroiderers’ alphabet chart found in ‘A Scholehouse for the Needle’. Here, my initials were 7 rounds deep. This is an incredibly small canvas to get an initial knitted onto. Gansey intials often give you twice that number of rounds for initialling. Lettering on extant Dales’ gloves is surprisingly economic on space and yet, works well. The earliest dated gloves, now with the Wordsworth Trust at Grasmere, bear the legend: “G.Walton, 1846”. The large case letters are also only 7 rounds high; the small case, 5. 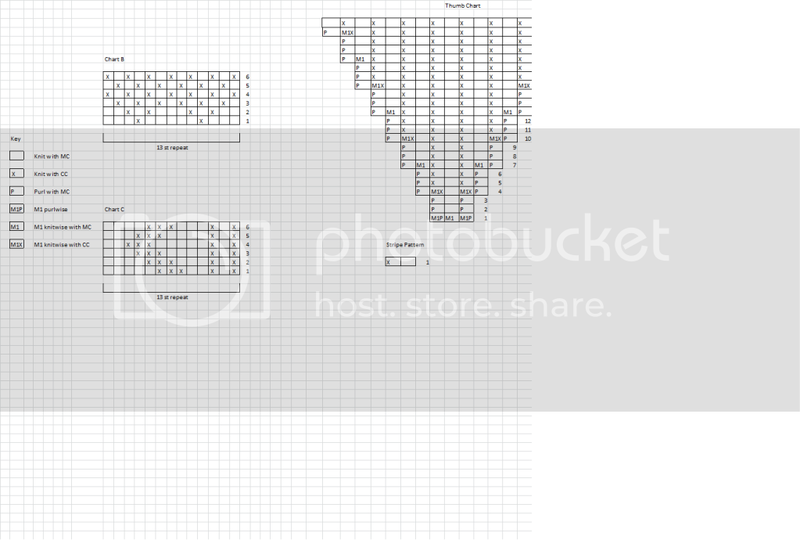 I have put up my own intials chart as a guideline, for spacing. You are not “dull elves” so can figure out your own. For the genealogists, I’ve recently been tracing some of my Dales ancestors – mainly farmers with the odd lead miner/farmer for variation. There are the Boothmans of Barnoldswick and the Coates in Wigglesworth, and Waterhouses who were masons in Arthington, nearer Leeds. A further delve into the Coates line gave me a couple of new names – both farming families in Wigglesworth, too, including the direct line ancestor (yet another farmer) with a rather good name; Lawrence Lawson. Lawrence is one of my sons’ middle names and I always wondered why that randomly popped into my head! Other Dales ancestors include the Westmorland Stephensons and Bellas family. Coates and Stephenson families are both mentioned in ‘Old Hand-Knitters of the Dales’ as ‘known’ families with knitting connections. But I am told that some of my Dales’ surnames such as my greatX2 grandma’s name, Alderson, are so common up there, people with them were given prefixes, so everyone could tell the different branches apart! Anyway, in homage to anyone with Dales ancestry, here are the Adderbacks. Hand is approximately 8″ across palm. If you want to make larger, use the larger size needles – experiment with tension first. Or any 2 strongly contrasting colours. Above, I used a blue and natural cream. With needles of choice, CO 56 stitches using CC. Before starting thumb gusset, ensure the lettering is centred – date is underside of hand, initials the top. For left glove, establish thumb in the stitches directly above the end of your final letter , and before start of first digit of date(should be start of round). For right glove, establish thumb above the stitches between first letter of initials and final digit of date). Basically, you just need to place the thumbs in the spaces between lettering/digits! These 2 Purls will mark where your thumb begins and ends. Maintain them as P stitches in every round. 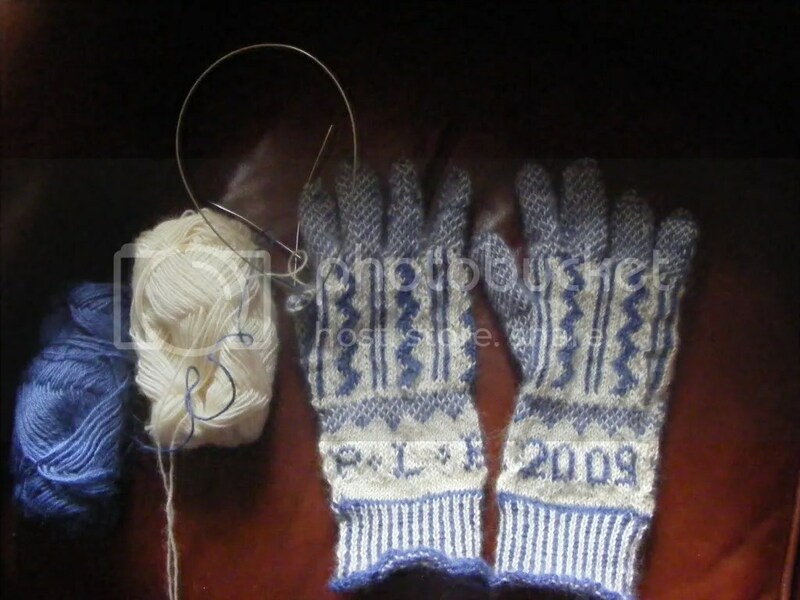 For thumb, make 2 increases every 3rd round, 1 after 1st Purl, 1 before last Purl. Keep increasing inside the P stitches every 3rd round, til you hit 13 sts inside the 2 Ps. Knit thumb in hit and miss st. I find it looks best if the Ps are in the MC, but do what looks best to you! When you have 13 sts between the 2 Ps [15 st], leave thumb gusset sts on waste yarn, til you are ready to come back and knit up thumb. For second glove’s thumb, remember to mirror first glove, insert thumb so that your initials will face up, date face down. 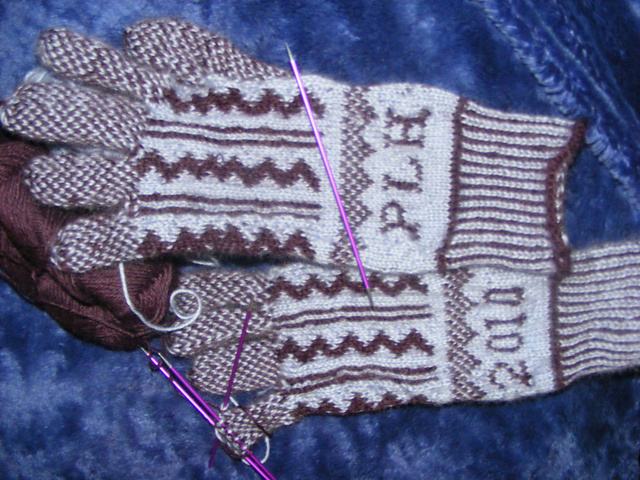 Whilst starting thumb gusset, knit main body of glove, using Chart C , til glove reaches base of your fingers. Place on waste yarn. Knit existing 15 stiches (now K those 2 Ps) and pick up 11 [26st]. Knit in hit n miss til you reach full length of thumb. Round 1: K2 tog to end of round, continuing in patt. Round 2: K1, K2 tog to end of round, continuing in patt. Break yarns, thread through remaining sts and fasten off. To divide for fingers: centre the first finger over the thumb. Ensure the centre of your sts for Finger 1 are above the thumb. Work in hit n miss until you hit top of your fingernail in length. Pick up 16 sts from waste yarn. Between Fingers 1 and 2, pick up 5 sts. Between fingers 2 and 3, Make 4 sts [25st]. Shape Top as for Finger 1. Pick up 18 stitches from waste yarn. Between Fingers 2 and 3, pick up 3 sts. Between Fingers 3 and 4, M 2 [23sts]. Pick up remaining 15 sts. Pick Up 6 sts between Fingers 3 and 4. [21 sts]. And finally… how many yarn shops do you go into where you can look out of the windows and see the donators of the clip that went to make your ball of wool? You can do that up near Leyburn at the Wensleydale Longwool Sheepshop. Breed specific yarns are a wonderful thing, and making a bit of a resurgence of their own. Another supplier of great British breed specific yarns, are Blacker Yarns. Had a great time yesterday at the Harrogate Knitting and Stitching Show, and now I’m all spent out. I was sad to hear of the demise of the 5 ply gansey wool, sold by Wingham’s down in South Yorkshire, but did manage to find a supplier of something very interesting. Over in Saddleworth, woolyknit.com are producing a range of yarns including some navy blue 4 ply which should knit up into something approximating to some of the finer, traditional ganseys that can be found in museums round the coastline. Woolsack were completing their epic quest, to craft 40 cushions using British Wool, over the Harrogate weekend and best news of all – this year we didn’t get snowed in after the show, and have a 5 3/4 hour crawl back the 20 miles from Harrogate (or ‘Arreget’ as I prefer to call it) to York. The overall message I came away with was to celebrate and support British wool. I will leave you with the Longwool Sheepshop’s Wensleydales, in the fond hope some of you may enjoy knitting Adderback gloves to match your mauve lightning print frocks.